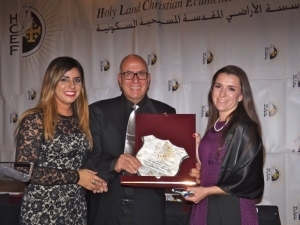 The Holy Land Christian Ecumenical Foundation (HCEF) held its Awards Banquet on the evening of October 16th and its 17th Annual International Conference on October 17th. 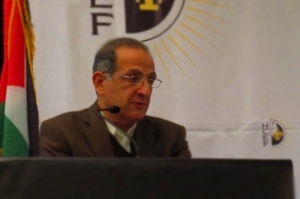 With the theme of “Our Faith Is Commitment to Justice, Peace, and Coexistence,” the events attracted over 300 participants including representatives of over 25 religious, governmental, and human rights organizations from throughout the U.S., Chile, Jordan, Palestine and Israel. Chiara was introduced by Renee Rabie, and Sir Rateb Rabie joined in presenting the award. 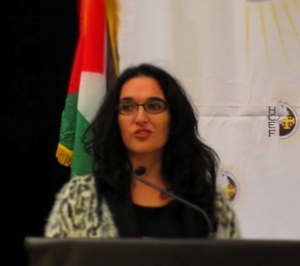 Chiara Cardone, Palestinian Youth Advocate and Consultant of HCEF’s Know Thy Heritage (KTH) Program, received the KTH Youth Achievement Award for her sustained and extraordinary effort to love, support, and stand in solidarity with Palestinian youth. Accepting the award, Chiara said, “It has been a great honor to serve the children of Palestine. This gift is for them – they have earned it through persistent dedication to their homeland. I am proud to be part of that. Anne-Elizabeth was introduced by Timothy Shriver, Chairman of the Special Olympics, and Sir Rateb Rabie joined in presenting the award. 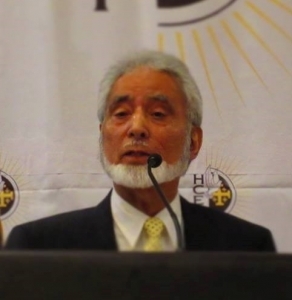 Dr. Sarsar was introduced by Father Drew Christiansen, HCEF cofounder and Board of Directors, and Distinguished Professor of Ethics & Human Development, Georgetown University, and Sir Rateb Rabie joined in presenting the award. 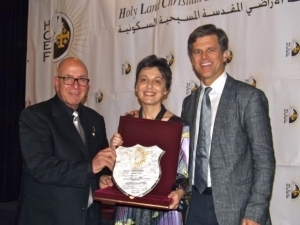 Dr. Saliba Sarsar, Chair of the HCEF Research and Publication Committee and Professor of Political Science at Monmouth University, received the HCEF Award, honoring his dedication to preserving the presence of Christians in the Holy Land. 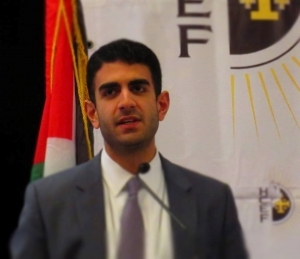 “I am proud to be part of the HCEF team. 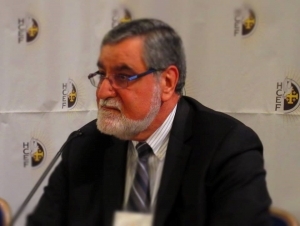 I know that my work goes far with this organization and I encourage everyone to join our efforts in any way they can, however big or small, we can make a difference,” said Dr. Sarsar. 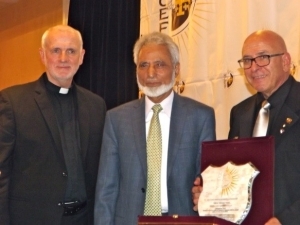 Dr. Syeed was introduced by Father Michael McDonagh, International Advisor to the Latin Patriarchate of Jerusalem, and Sir Rateb Rabie joined in presenting the award. Adv. 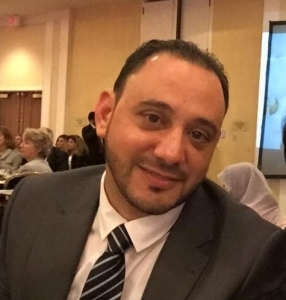 Rofa was introduced by Elias Saboura, Esq., , and Sir Rateb Rabie joined in presenting the award. 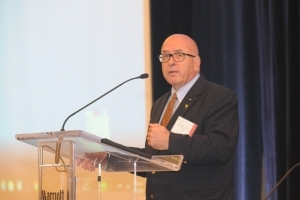 The Conference was emceed by Dr. Sarsar and Dr. Stephen B. Corbin, former Special Olympics Senior Vice President of Community Impact and Support in Washington, DC and Living Faith Lutheran Church Elder in Rockville, MD. 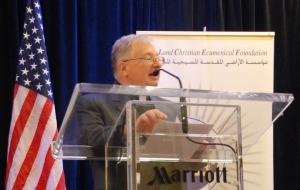 It began with an opening prayer by Father William J. Turner, HCEF Board of Directors, and the day’s event consisted of five main panels, a presentation, and a roundtable discussion—all mainly focused on the need to be educated about issues surrounding Christians in the Middle East in general and in the Holy Land in particular as well as the need to advance justice, peace, and coexistence in the Holy Land and beyond. 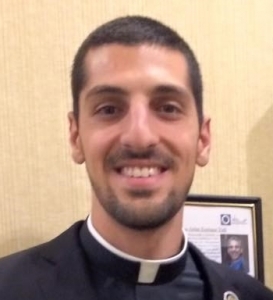 Zuhair Madanat, a First Theology Seminarian at Mount St. Mary’s Seminary in Emmitsburg, MD, moderated the first panel on “Palestinian Christians: Persecuted on All Sides.” With the burning of churches and holy places, such as the Church of the Multiplication of Loaves and Fish, and the new threat by ISIS, which has threatened to “purify” Jerusalem if Christians do not leave the sacred city, the panel examined the conditions affecting Palestinian Christians and looked to signs of hope for the future. 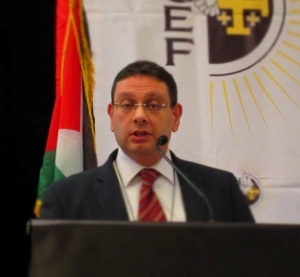 Dr. Mazin Qumsiyeh, Professor & Director, Cytogenetics Lab, Palestine Museum of Natural History, Bethlehem University, stated that “living in Palestine takes sacrifices and Christians leave not because of economic reasons but because of political reasons.” Reporting on some of the horrors taking place in the Holy Land, Dr. Qumsiyeh explained that “we Palestinian Christians called for action, for example, via Kairos Palestine.” Kairos Palestine is an organization of Palestinian Christians who call on Christians around the world to counter the occupation. 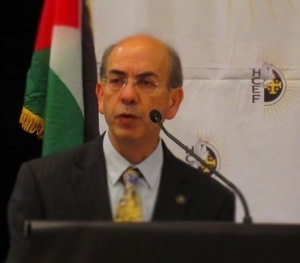 Dr. Sarsar then presented on “Who are the Christians of the Middle East?” He spoke of the Christian presence as dating back to the advent of Jesus Christ, which has been uninterrupted for more than 2,000 years. While Christians constituted some 20 percent of the population at the start of the 20th Century, that number today is less than 3.5 percent. 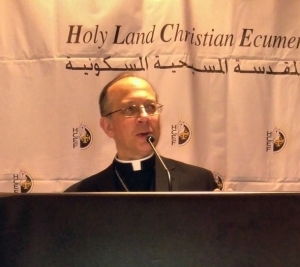 Even though wars and instability have ravaged Christian and other communities and even though some Christian communities are being threatened and persecuted, signs of hope present themselves, as expressed by the Egyptian Family House initiative that fosters religious unity, Christian-Muslim dialogue in Lebanon, the work of HCEF and Caritas in Jordan and Palestine, and HCEF’s founding of the U.S. Muslim Christian Coalition for the protection of Christian and other religious minorities in Arab countries. Sir Rabie led the roundtable discussion on the HCEF movement. 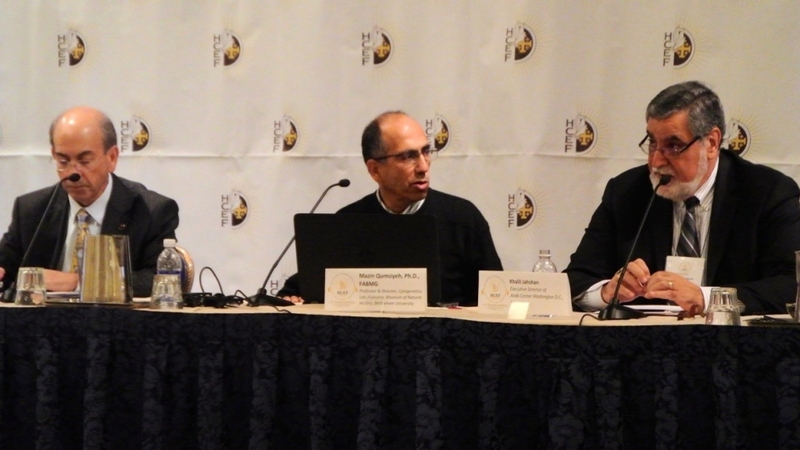 He highlighted major HCEF accomplishments and invited HCEF staff and volunteers to share their experiences. 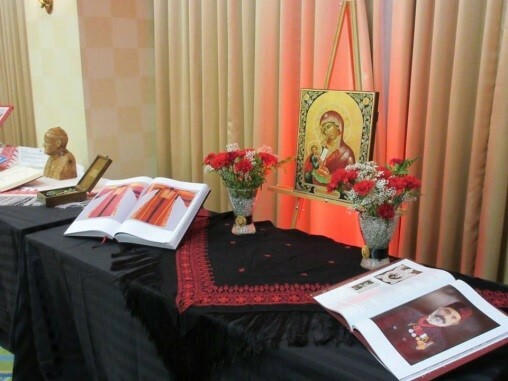 In addition to celebrating the sainthood of two Palestinian women in Rome, HCEF opened the Bethlehem Museum, led the fifth delegation of the KTH program, inaugurated the Future Business Leaders program, formed and is heading the U.S. Muslim Christian Coalition. Sir Rabie invited all to become involved, live an integral, purposeful life, and join the HCEF movement to make a real difference. He pointed out several volunteering opportunities available in both HCEF offices, Bethesda and Bethlehem. Adv. 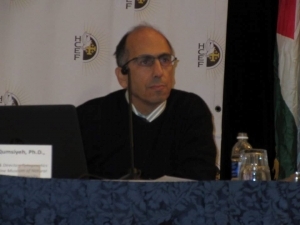 Rofa, Director of the Society of St. Yves, spoke of Israel’s systematic policy of discrimination. 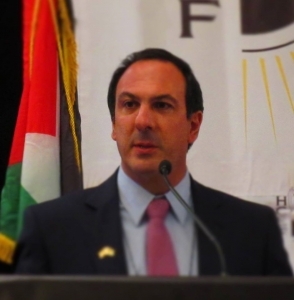 He offered a variety of examples, such as “the lack or improper planning rights for Palestinians resulting in the issuance of demolition orders against their structures in East Jerusalem and area C of the West Bank, the confiscation of privately owned Palestinian lands and declaring them as state land and then dedicating large tracks of these lands for settlement expansion, limits on the freedom of movement, and the building of the annexation or separation wall.” He then focused on the residency rights violations, including family unification and child registration, and the Cremisan Valley case, “which sets the clearest example for Israeli annexation policies under the pretext of ‘security.’” Both speakers concluded by indicating the need for global cooperation in order to protect Palestinian rights, especially through the effective implementation of international law. The fourth panel on “The Role of Women and Youth in Building the State of Palestine” was moderated by Noor Shayeb, Human Resources Associate at Chemonix, and KTH alumna. 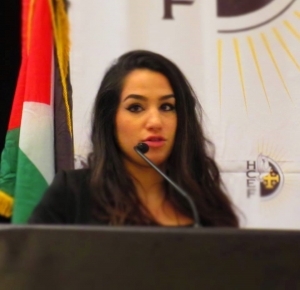 A main point is acknowledging the fact that Palestinian women are at the heart of their families, society, and national development, and that the youth are the future leaders of Palestine. The panelists agreed that Palestinian women and youth are already mobilizing as active champions of justice, peace, and coexistence. Rana Shouman, Pharmacist, Mercy Hospital, and KTH alumna, spoke of how she is raising awareness, advocating for coexistence, and promoting social justice and peace. 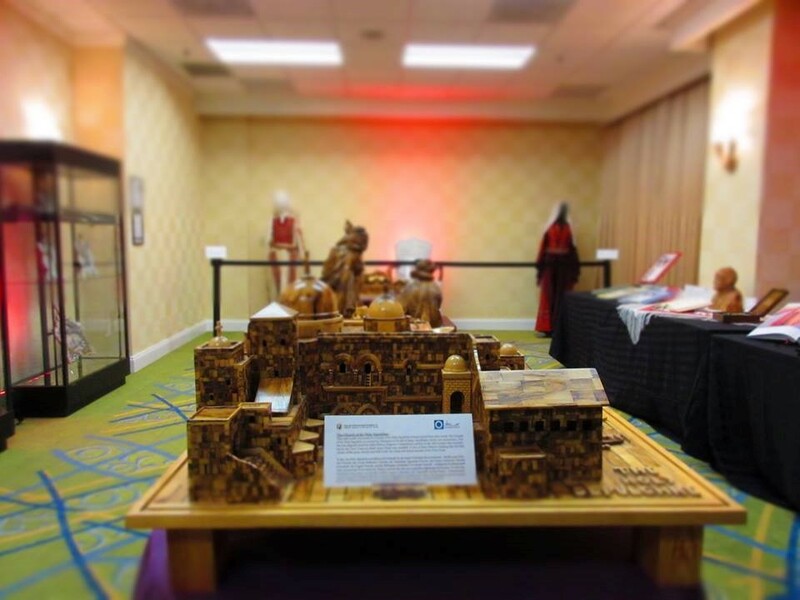 Also included as part of the Conference was a special travelling exhibit of the Bethlehem Museum. Among the impressive pieces were olive wood replicas of the Church of Nativity and the Holy Sepulcher, rare embroidered dresses from the Munnayer collection, Papal relics, including the chair used by Pope John Paul II during his visit to the Holy Land, and Mother of Pearl masterwork pieces provide by Palestinian-Columbian artist, Enrique Yidi. 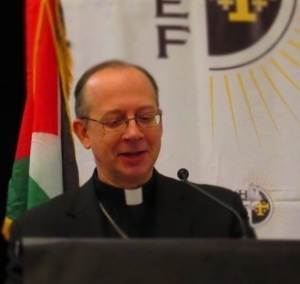 The conference concluded with a commitment to put faith into action and double efforts to support Palestinian Christians and others in the Holy Land. Fr. 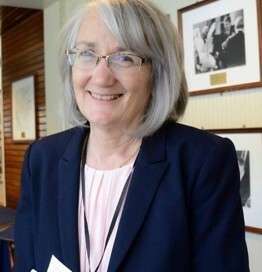 Christiansen led the conference participants in a closing prayer. If you are inspired by the work HCEF has done, expressed by the 17th International Conference and Banquet as a whole, please JOIN US and aid our effort! 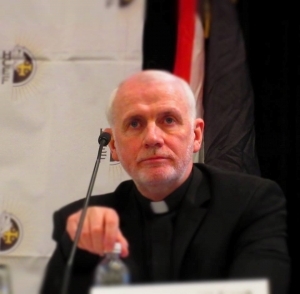 There are countless opportunities to work for justice in the Holy Land and serve those in great need, both in Bethesda and Bethlehem – our brothers and sisters, preservers of the faith and keepers of the Mother Church.